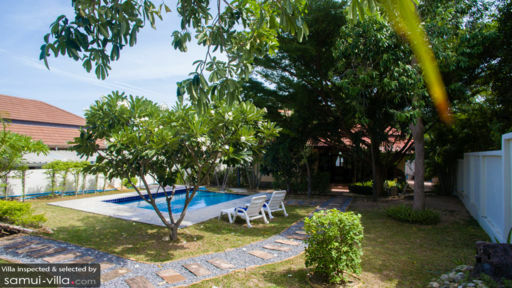 Villa Swiss Garden is located in a prime location in Choeng Mon, South Samui, within proximity to the airport, local amenities, restaurants and attractions. 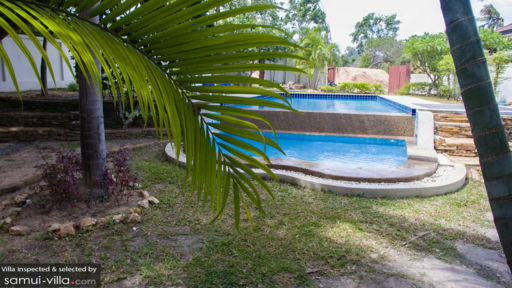 Featuring a landscaped garden, well-appointed living areas and two bedrooms, the villa is ideally kitted out for small families or sharing among two couples. Each of the two bedrooms at Swiss Garden features air conditioned interiors, a king bed, canopy netting, terrace and private en suite. Soak up the breezy Samui vibes outdoors at Swiss Garden’s landscaped garden. 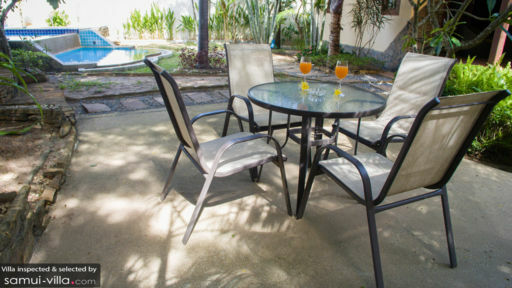 An outdoor dining set lets you enjoy breakfast or a juice by the poolside, while the sparkling pool is ideal for cooling off from the midday heat (it flows into a shallow wading pool that’s perfect for your little ones to splash about in!). A terrace, equipped with daybeds and armchairs is a favourite spot for lounging or shaded siestas. The living spaces at Villa Swiss Garden are homely and inviting, with dark wood furniture, artworks and full-length glass doors that allow the sunlight to spill in. A fully-equipped kitchen, featuring a fridge, microwave, kettle and utensils allows for self-catering or private chef services. Villa Swiss Garden offers weekly housekeeping services, in-villa spa treatments, personal chef services, barbecue facilities and a baby cot. An English-speaking guest manager will attend to your holiday needs. Villa Swiss Garden is located in Choeng Mon, within close proximity to key attractions and amenities in North Samui. Choeng Mon Beach is located about 15 minutes’ drive away. Its quiet shores and kid-friendly waters makes it a popular attraction for expats and family vacationers. Chaweng Beach, located about 10 minutes’ drive away offers a lively ambience, plenty of dining options and a vibrant nightlife scene. Choose from a variety of casual and fine-dining options (this includes excellent in-villa dining experiences at your villa). We like SALA Samui Restaurant and Pangaea for its intimate, cosy ambience. The Orchard Restaurant and Bar and Garland Samui dish out some of the tastiest plates of Thai fare in the area. Unwind with a nightcap after dinner with drinks at one of the seafront restaurants dotted along Choeng Mon Beach. Hop into a car for a ride out to iconic cultural attractions like Big Buddha and Wat Na Phra Lan. Fisherman’s Village, a bustling hub with boutiques, restaurants and cafes offers a great family experience. Outdoor enthusiasts will also enjoy exploring Samui through a bicycle tour to take in its scenic landscapes and coastlines. Or embark on an offshore expedition to Ko Tao, a destination known for spectacular freediving and scuba diving experiences!